ISLAMABAD, Dec 21 (APP):Chairman Senate Muhammad Sadiq Sanjrani during his official visit to Saudi Arabia visited the Headquarters of the military alliance established under command of Saudi Arabia for restoration of legitimate government in Yemen along with members of his delegation.Chief of the Military Alliance Lieutenant General Prince Fahad Bin Turki Bin Abdul Aziz Al Saud gave a briefing to the visiting delegation regarding the joint military forces and their operations, says a press release. Chairman Senate expressed appreciation of the warm welcome and hospitality from the hosts. 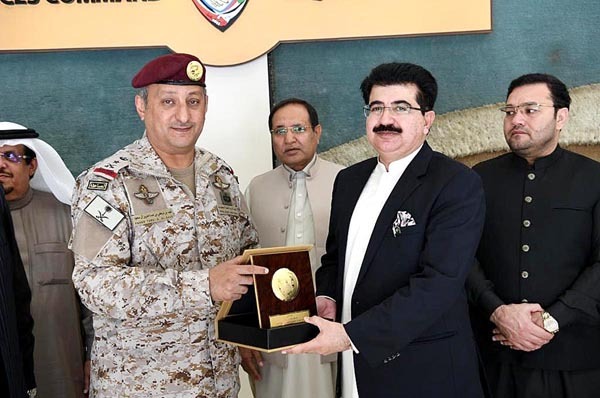 Sadiq Sanjrani observed that the Muslim Ummah was facing a heap of issues of which terrorism was the primary and Saudi Arabia had also faced a number of such incidents planned internally and externally. He remarked that Pakistan has always stood against terrorism and its incited activities and will always support the cause of rooting out terrorism. He said that Pakistan supports unconditional restoration of peace and return of occupying rebel forces. He appreciated the efforts of the joining military forces in restoration of peace in Yemen. The delegation was told by the chief of military alliance that prominent success has been achieved in restoring peace and return of rebels in Yemen. Chairman Senate expressed his hope that the coalition of military forces will garner more support from other countries and be more successful. He said that His Majesty King Salman Bin Abdul Aziz and Crown Prince Muhammad Bin Salman have took all possible measures for bringing peace in Yemen and for rehabilitation of people which is highly commendable. After successful official visit, Chairman Senate along with the parliamentary delegation arrived in Madina Munwara where he was received by the senior members of the Shura Council. Chairman Senate and his delegation was to leave for Makkah for performing Umra after offering Jumma prayer at Masjid Nabvi.